Sign up now for Pre-Teen/Teen Group! Home > Groups > Sign up now for Pre-Teen/Teen Group! The spring 2019 Pre-Teen/Teen Group will be running Tuesday March 5th through April 23rd from 2:00PM – 3:00PM. Check the calendar for the latest details on scheduling & location. This group’s curriculum will focus on social conversations: introductions, good listening, finding common interests, and two-way conversation. Also note that, with parent permission, video modeling will be used in group as a learning tool; participant role plays will be videotaped, shown to participants, and shared with parents as well. To schedule an intake, call 843-792-9162 and request a Project Rex Assessment. Once the intake is complete, contact administrative assistant Lavinia Bowens at 843-792-9162 to confirm attendance in the group series. Please plan to arrive 15 minutes early for sign in and registration. 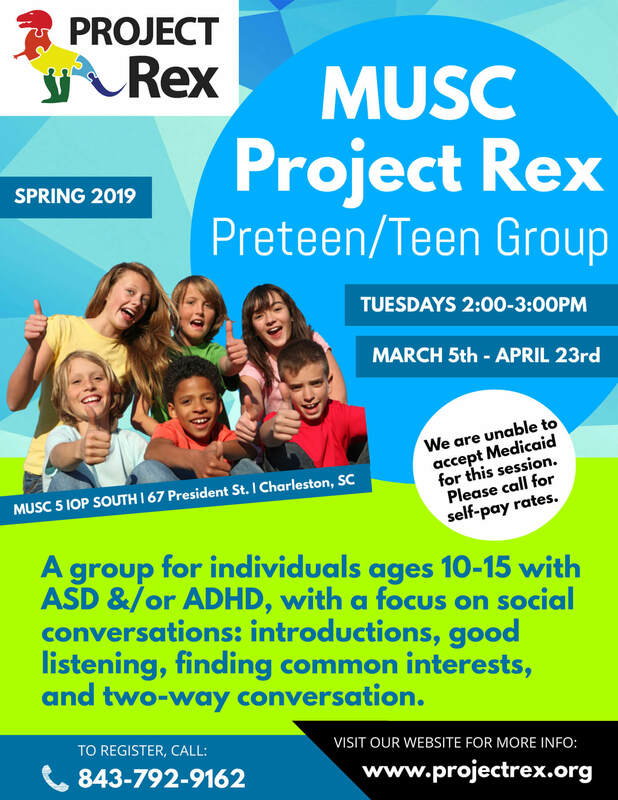 Project Rex groups include a mandatory parent component that meets at the same time as the Pre-Teen/Teen group. At this time, we are temporarily unable to accept Medicaid for group services. We appreciate your patience and understanding as we work closely with South Carolina Medicaid to get Project Rex services covered. Project Rex is committed to serving patients with all insurance types. We also offer a self-pay option for groups. Please call LaVinia Bowens at 843-792-4113 for information about rates. Interested patients and family must commit to being able to attend each group session. We can no longer allow patients and family members to join the group after the first week. We ask if you know you cannot commit to the full 8 week series to instead consider attending a future round of the program. Thanks for your continued support and cooperation as we work with all insurances to ensure that our programs remains available to all children. Know someone who may be interested in this group? Please share this post or pass along the flyer! Enter your email to receive your free copy of Professional Life Skills for Adults with Autism, a sample Project Rex lesson, along with posts delivered to your inbox! "Enjoy a delicious meal prepared by our wonderful sponsor The Kickin’ Chicken located at 1179 Sam Rittenberg Blvd in West Ashley. C. Joe Moore will be speaking about Adaptive Expeditions. While enjoying your meal learn all about what Joe is doing and network with other businesses, organizations, professionals and families. Bring your business card if you have one and your curiosity to add to the discussion. To reserve your place at the table, please contacts us by May 6th so the kitchen can prepare! You can email or call Jane Vaughan at vaughanj.synergyss@gmail.com or 803-760-6197. Be sure to specify the event and how many will be attending. Be sure to check out the attached flyers below and email or call with any questions and to reserve your seat! I hope to hear from you today!" Whether you work in a noisy office or you’re looking for a meditation aid, the best noise-cancelling headphones will end up being used for a lot of different things over the course of a lifetime. The Project Rex Team consists of doctors and therapists with a passion for helping children and young adults with Autism Spectrum Disorders and their loved ones. We provide support and treatment for individuals with Autism Spectrum Disorders and their parents. Our goal is to help children and young adults to reach their highest potential by enhancing their social skills, their ability to understand emotions, and their adaptability. You can help support Project Rex with an online donation today. Click the "Donate" button below and select "Project Rex/MUSC Autism Spectrum Development" as your designated program.